This article submitted by Linda Stelling on 5/5/99. The Glenz family tradition started in 1884 when William Glenz donated land for the Emmanual Grove Evangelical Church Cemetery. Recently, Roger Glenz turned over his secretary/treasurer books to his son, Brad. Brad will be the fourth generation to serve on the Emmanual Grove Cemetery Board. William Glenz served on the church cemetery board. In the early 1920s, his son, Emmett, donated more land to the church to enlarge the cemetery. He also served on the board. Even though the small country church was discontinued in 1934 and torn down in 1938, the Glenz family continued to serve on the cemetery board. When the church was torn down, the church bell was purchased by St. Anthony Catholic Church in Regal. "All the cemetery records were in German up until 1923," Roger Glenz, Paynesville, said. Roger served as secretary/treasurer on the board. The two offices were combined in the late 1970s. "Early records show that the church and cemetery cost about $1,000 to maintain. This included the pastor's salary, janitor's salary, and maintenance. In the early 1930s, money was scarce." "For 20 years no records were kept," Roger said. "The cemetery board was reorganized in 1970 and a new title to the land was drawn up," he added. "The cemetery was in poor financial shape for many years. In 1970, Steward Hoeft and I contacted all the families that had someone buried at Emmanual Grove to help financially with the cemetery's upkeep," Roger said. Brad said as a child he mowed the cemetery and now his children, Amanda and Nathan, are mowing the cemetery. "The first graves at the cemetery were dug in 1885. Today there are 135 graves at the cemetery. Some day, I plan on being buried there," Roger said. He added that there are still about 10 grave sites available. 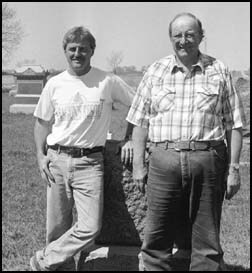 The last two people buried at the Emmanual Grove Cemetery were Steward Hoeft in the fall of 1995 and Joyce Manz in the spring of 1996. Roger recently retired from the cemetery board after serving 36 years. His son, Brad, is the fourth generation to serve on the board. "Dad (Emmett) served on the board 20 years and I took his place in 1963," Roger said. As secretary, Roger has had to keep minutes at the annual meeting. There are five members on the board. They are Brad Glenz, Bob Brauchler, Art Voss, Dave Hoeft, and Burton Manz. "It's hard to find young people willing to work on a cemetery board," Roger said.